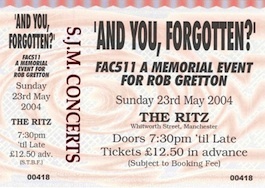 Notes: Held at The Ritz, Manchester, 5 May 2004; benefiting Manchester Kids. Line-up: A CERTAIN RATIO (w/PETER HOOK for 'Heart and Soul'), Doves (acoustic; w/BERNARD SUMNER for 'Bizarre Love Triangle'), MIKE PICKERING, GRAEME PARK, Jon Dasilva, Mr. Scruff, Dave Rofe and AHW. Also an Observer music monthly supplement (with FAC number); articles include a ROB GRETTON profile by Miranda Sawyer and a "Q & A" with AHW & PETER SAVILLE.